Depending on the nature of your business, the holidays might be your busy period… or they might be slower than usual. This might be the time of year where your website sees huge spikes in traffic, or it might be when your clients are too busy with their own busy season to spend time on your site. Either way, there are a few things to be thinking of over the next few months. Even if you’re not in retail, you could experience a rush in the last quarter of the year. If you’re an agency, your clients might want to squeeze in one last project before the holiday break. If you work with non-profits or any clients on an annual budget, they might need to use up funds by the end of the year in order to get reapproved for funding the following year, which might mean last-minute projects for you. Some people might want to make home improvements before houseguests arrive, others might want to plan a vacation to a warmer climate. Check that your website can handle the uptick in traffic. Log in to your Google Analytics account to see your overall traffic trend as well as the trend for Q4 last year. If you saw a spike last year and/or if your traffic has been steadily increasing this year, you can probably expect a bump in site visitors around the holidays, in which case you might need to upgrade your website hosting plan to accommodate the influx. Develop engaging content for social media now to be shared throughout the season. You don’t want to be caught up in the holiday scramble and end up putting out something that feels rushed. Take the time now to brainstorm topics and create any necessary content, then schedule it out in advance via Facebook’s scheduler or a program like Hootsuite or Tweetdeck. Update copy and imagery on your website to match your holiday messaging, offers, etc. Walk through all the ways people can contact you and ensure everything works smoothly. Does your contact form display a thank you message after submitting? If people post a review of your company on Google, do you read and respond to it? Do you monitor all social media channels and reply quickly to any questions? It’s best to have a process in place now so that you’ll know how to respond when more people are contacting you. Your company might fall into a category that’s not as busy around the holidays. Maybe you’re a law firm that specializes in estate planning and your clients feel they can put it off until the new year. Or you could be in auto repair, where your customers are hoping to postpone replacing their tires until after they’ve paid off their holiday credit cards. Perhaps you run a local pizza restaurant and most of your clientele will be eating home-cooked holiday meals. You can send a message on Thanksgiving thanking all your clients for choosing to work with you. Post fun or informational content on social media – you’ll stand out from the crowd because you won’t be posting about your products or services non-stop. Just be sure everything is on-brand and targeted toward your audience. Think of out-of-the-box ways your business is in fact relevant to your clients. Sure, people eat a lot of homemade meals around the holidays, but they also have houseguests that need to be fed on the other days and they don’t always have the time or energy to cook. Your restaurant can help! Sure, a new set of tires is an expense, but safety and peace of mind are worth it, plus your clients can save $200 this week! Sure, estate planning can wait but it couldn’t hurt to schedule a free consultation now and then come back in the new year to finalize the paperwork so that it’s not hanging over their heads all next year. 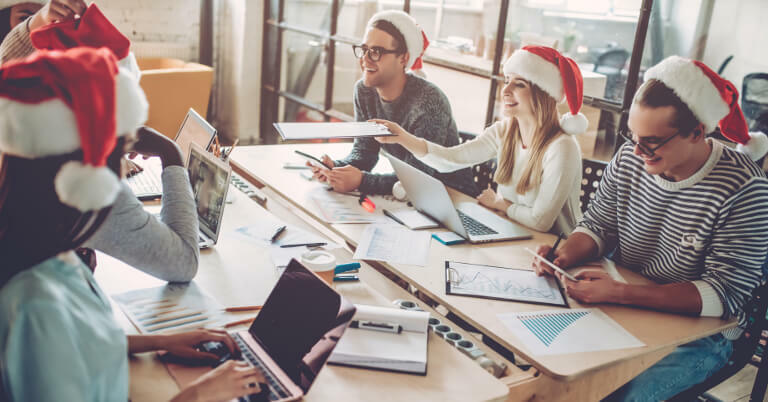 You don’t want to wedge your business into the holidays – and you certainly don’t want to push your business during a time when people are focused on other things – but one or two carefully crafted messages is fair. And… if your current website isn’t quite resonating with your audience, maybe it’s time for a redesign. Perhaps your offerings have changed or you have more mobile traffic now (most sites get more than 50% of their traffic from mobile these days) but your site doesn’t display well across various devices. Revamping your site now means it’ll be ready when your busy season arrives. Whatever your situation this holiday season, it’s a good idea to start planning now. And once you take a look at things, if you realize you could use a little help, we’re here! Our team of experienced web developers, online strategists, and digital marketers is here to make the holiday season a success for your business. The holiday season is officially underway, which means it’s time to start thinking about your website and marketing plans for the next few months. While the holidays often turn into a time of commercialism and frenzied gift-buying (think Black Friday and Cyber Monday), they can also be a great time to focus people’s attention on non-profits and charitable giving.